This writer won’t be breaking any new ground to tell you that ultimate is a game of matchups. With the exception of an extremely windy day, many high-level games are played in a manner where the team that can win the most one-on-one matchups will win the game. That’s why the sky is such a hallmark play of the sport. It’s the tangible evidence of a matchup win. It’s a notch in the belt. It’s a tally mark. It’s an important point within the hundreds of smaller points that make up the actual points that determine a winner and loser of an ultimate game. That’s why I’ve taken it upon myself to chronicle some of the biggest skys of the 2018 college season. There are a lot of ways to account for what makes a “big” sky truly BIG. In my humble opinion, the most important determinant of a big sky is the amount of disrespect that comes with it. Disrespect is a fluid and elusive idea to define in the world of sport, but if you follow along, you’ll get an idea of what disrespect means to me. Hopefully some of you reading this are already prepared to be outraged that some writer from Ultiworld is stealing content from The Ringer’s Shea Serrano. Unfortunately for you, I’m going to cop to the theft before your indignation has time to truly ferment. Serrano’s Disrespectful Dunk Index and disrespectful dunks in general are some of my favorite things about the NBA. Similarly, in ultimate, there are not many things that more greatly please me than a good, respectful1, disrespectful sky. For that reason, and in homage to the work that Serrano does, I’m hoping to compile a rating of some of the most disrespectful skys of the 2018 college season. First, I need to explain the rating system—which, again, I’m chiefly ripping off of Serrano’s framework. There are two sides of this coin: 1. What is the level of athleticism required to make this catch? and 2. How likely did I think it was that that the receiver was going to complete this catch when the throw went up? The answers to those two questions do not necessarily wield equal weight. A shockingly athletic catch made by a receiver that I’ve come to expect great things of2 may not garner the same amount of points as a catch from a quieter player. I am a purveyor and appreciator of all types of celebration. Few things get me more hyped than a good stare down or look back at a defender. Few things make my jaw drop further than when a player makes a mind-blowing play to only walk back to the sideline ignoring his/her teammates’ screams of ecstasy as if nothing greater than a stoplight changing from red to green just happened. Few things make me feel the essence of ultimate more deeply in my bones than when a player executes a spike so hard that I can swear I feel the impact of the disc on the ground from where I’m sitting. The better the reaction, the more points awarded. People love “Beau Jumps Over a Guy” and yes, it’s a truly remarkable athletic feet, but here’s the first of many hot takes you’ll find in these pieces: it’s not even close to being the elusive Perfect Sky. The SDSU defender in the video doesn’t even leave the ground. Kittredge so outmatched the young man on the opposing team that he probably didn’t even have to jump to make this catch. It’s an impressive play, but in the Disrespectful Sky Index it would have received 0 points in this category. Unfortunately, in ultimate we aren’t yet to the point where backstories are really a thing. Many times, this may be contained to just the single game in which the sky takes place. Have these two players been guarding each other the entire game? However, in the rare occurrence that a backstory does exist, you better believe it’ll be taken into account. If Sandy Jorgensen Mosses on Jesse Shofner at Club Nationals next year,3 that will be full points in this category. 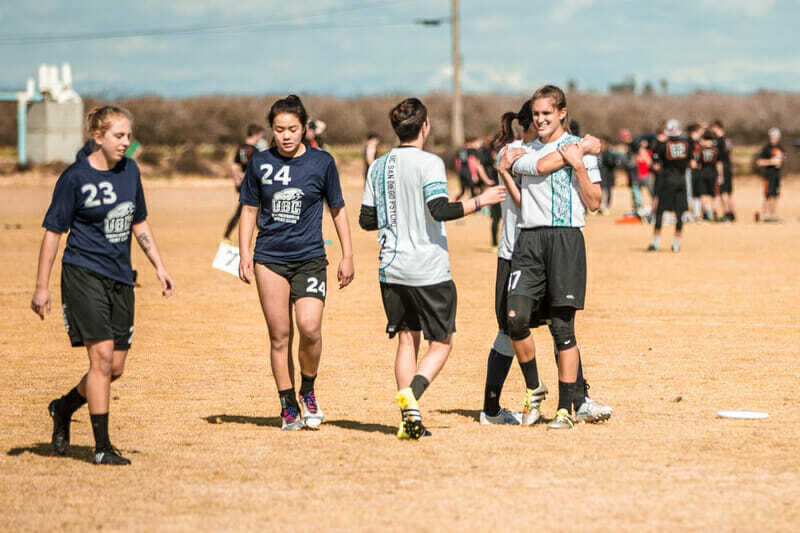 A disrespectful sky at 1-1 in pool play of Stanford Invite is great and should be lauded, but does it deserve the same amount of points as a disrespectful sky on double game point in bracket play at Nationals? The answer is quite obvious. Because this is ultimate, one of the most important questions here is: Was there a crowd at the game? Even if it’s just a few local high schoolers, that can make all the difference. After that, it’s up to teammates and opponents to determine how many points are awarded. Does a teammate faint? Does an opponent look away like he just saw someone Gordon Hayward themselves? Those things can mean a lot to the total amount of disrespect in a sky. Comments on "The Disrespectful Sky Index: 2018 College Season, Pt. 1"